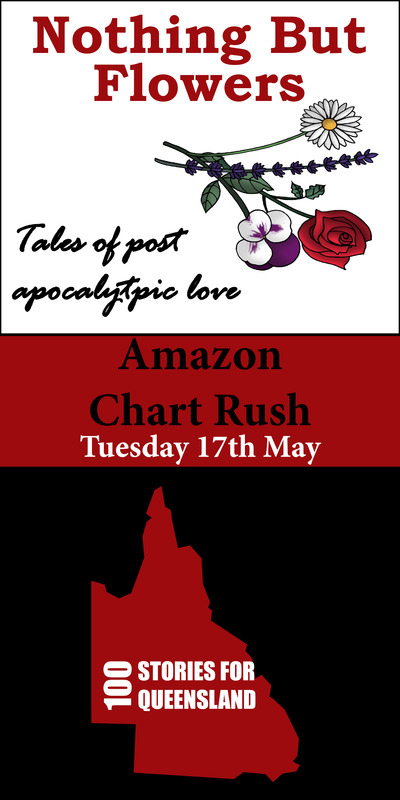 Not content to release just one book… I’ll be releasing TWO books this coming Tuesday(17th May) in an Amazon Chart Rush tag-team of epic proportions. Readers are invited to purchase a book on Amazon, in a nominated 24-hour period, with the intent to capitalise on the volume of sales to move the book up the Amazon best seller list. The higher up the chart it is (we’re aiming for a spot in the top 100) the more visible it becomes to other readers who may go on to purchase it. It’s all about exposure and helping new readers find the books. By releasing both charity anthologies concurrently we’re hoping people will add one extra book to their cart on the day, whether that be someone stumbling onto 100 Stories… or Nothing But Flowers for the first time. If you can’t buy on the day, you can add it to your wishlist. Every little bit counts to rocket the books up the chart. You can find both books on Amazon and Amazon UK. What is Nothing But Flowers? Nothing But Flowers is the second Literary Mix Tapes anthology and the first to make it into paperback. It started on the 6th January (a week before 100 Stories was launch) as a Valentines Day anthology with the brief to create stories exploring the challenges and complexities of love in a post-apocalyptic world. With the flood disaster already weeks old, I suggested to the authors involved we donate the money generated by the sale of the anthology to a flood related charity. But I had no idea the disaster which was only days away and waiting to travel in the worst apocalyptic sense, down the Lockyer Valley and into Brisbane. I worked on Nothing But Flowers side by side with 100 Stories for Queensland, in a crazy juggling act which was made possible by the wonderful support of Maureen, David, Trevor, Nick and all the other wonderful literary folk who read, voted and edited the stories of 100 Stories for Queensland in the first six weeks. When Nothing But Flowers was web-released on Valentines Day the hits to the site were the equivalent of selling 60 paperbacks in 48 hours! The book has been getting rave reviews, so please, if you are dropping into Amazon on Tuesday to buy 100 Stories, consider adding Nothing But Flowers to your shopping cart! All funds collected from the sale of Nothing But Flowers will be donated to the Grantham Flood Support Flood. Well I am being a true renegade – writing one blog post a day seems impossible, even in a week when I am technically between projects. I’ve been making the most of it, catching up with long overdue admin, writing and shock horror – taking time out to do a few nice things for myself. So I’ll just keep plugging away through the alphabet as best I can, until I get to “Z”. Might be the end of May – might be the end of June. Hopefully sooner rather than later though. I had a laugh out loud moment when I read Em Newman’s catch up post yesterday, which includes “G”, because she also lists Goodreads in her section on G. How did it take me more than six months to fall in love with Goodreads. I was first introduced to it back in October last year when Lily Mulholland, unfailing in knowing just how to promote something, told Paul and I she’d put The Yin and Yang books up on Goodreads and helped to step me through it. I accepted the author account and my own personal account. I admit I was clueless. My brain was so full of ‘other stuff’ at the end of last year and then all of this year, that I never really gave myself a proper chance to acquaint myself with Goodreads. In the past week it’s all changed, and I’ve see how powerful a tool it is to connect with readers. For a publisher – I can look at the number of people who have listed our books on their shelves. It’s mind blowing for me… to see pages and pages of people who have listed one of our books as ‘to read’. I know exactly who to let know when the paperback of any edition comes out. Goodreads also allows you to promote your book with competitions – which I imagine will become far more popular with Facebook’s most recent change to its Terms and Conditions which no longer allows Facebook as a platform to promote or run competitions. Seems you have to pay for that privilege now! buy your book with one simple click! see an author’s latest blog posts and comment without having to click through to the site. What I like most is being able to have shelves entitled “books I am in” and “books I have edited”. It is one of those few platforms which functions for all interested parties, ie. everyone who loves or has an investment I books. 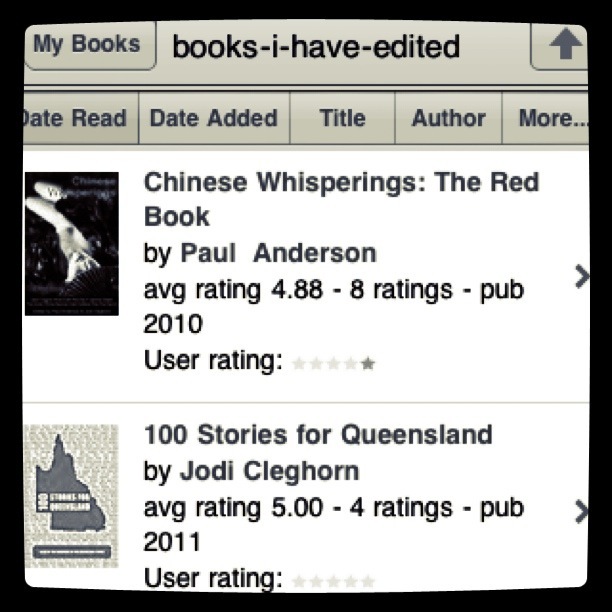 The best thing about Goodreads – they have an awesome App, which is simple and effective to use. Perfect for updating what page of your current book you are on before you turn out the light and snuggle in under the doona. The one thing I’d like to see… the ability to upload a photo of you and your current read to the site. I know the buzz generated when you pair reader with a book. Goodreads really is the one stop shop for readers, writers, editors and authors to connect, interact and share. Where did the time go? My son will be seven in just a few weeks. He’s about to move out of the most primal of the seven-year cycles and into a far more independent one (energetically he’ll move out of my Etheric field and into his own!) I’ve known it’s coming and I’ve seen the shift away from me being the centre of his world. His Dad now is (almost) the most important person in his world. I’ve also noted he’s started to gather and take account of the important men in his life – his Poppy, his Uncles, close male family friends… and in that accounting, recognising the men who are absent in the most part. But there’s nothing like an every day moment to really hammer it home… how fast he’s growing up. Yesterday I took him to buy some long sleeved t-shirts and discovered where we went, size seven shifts him into a whole different section and style of clothing. In the new section there weren’t half as many awesome (and cute) shirts, but there was one with zombies on. So what’s a Mum to do? 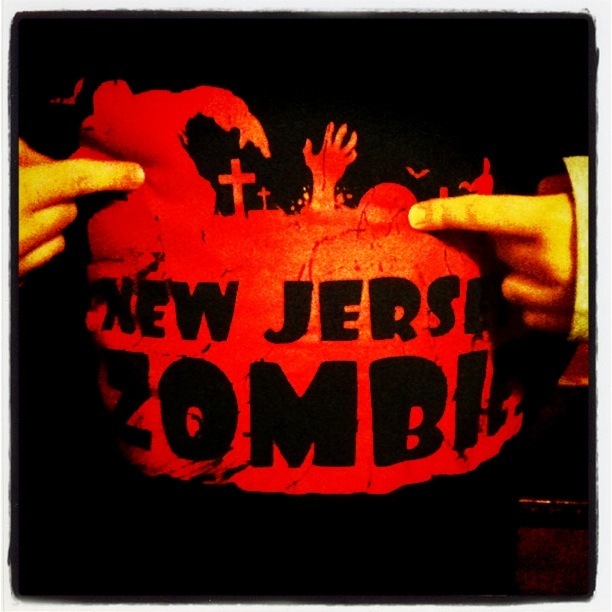 Relent – and let him have his first zombie t-shirt. I had a flash back to the first time I bought him a skull and cross bones shirt – Size Three! he still squeezes into it. I refuse to think of myself as time poor. This is despite hammering down the door of a major deadline for the first of eMergent Publishing’s non-fiction clients, keeping the fires of Chinese Whisperings stoked, preparing for my first virtual book launch and trying to keep afloat in life. If I bring a poverty mentality to my working and creative life I can’t expect keep my head above the water. Yes – I’d like more sleep, yes – I’d like more time to read, yes – I want to spend time with my family and yes – I am yearning to write (especially since my kind characters chose this very week to reveal the previously hidden hooks of a story to me in the shower on Thursday) but this too will pass. The non-fiction project is a planning text called ‘Gnarly Planning’ by the wonderful Dr Jane Stanley. The book is amazing and definitely not your run-of-the-mill university text. Instead it is full of inspiring personal stories from Jane’s adventures overseas, humbling accounts of people making do with very little and lots of good old common sense, that doesn’t just apply to the area planning, so I’m discovering as I read and layout. While it continues to be a very consuming experience for me – the plethora of astounding photographs and the text in general keeps me going. It is the only experience of working/reading a non-fiction book where I have been inundated with waves of goosebumps. Speaking of time – tomorrow is my first time as part of a virtual book launch (Saturday for those folks in the Nth Hemisphere) Absolute Xpress’ “Thieves and Scoundrels” anthology, which my short story “The Chameleon” is published in, is officially launched tomorrow. There are two parts to the launch – a rolling stock of ‘virtual’ interviews with some of the anthology’s authors (12 authors, in 9 time zones, across seven hours) as well as an Amazon chart rush. While I’m part of the virtual interview section – to promote myself, my story, my writing and of course the anthology, I’m also participating to see how it all works and what sort of fit it might be for The Yin and Yang books in October. I’ll be talking/typing about about my story, what I’m currently working on, my influences and what I find challenging about flash fiction. You can be a part of the author chats by following this link. The other aspect of the launch is an Amazon chart rush. All these things will increase the book’s ranking on Amazon.com. 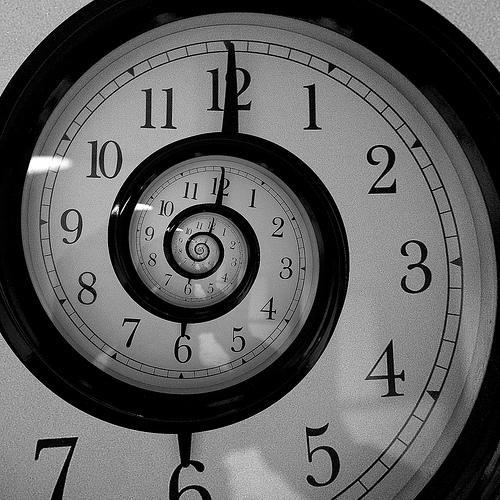 Now, speaking of time… I have some interview questions to get sorted and some sleep to be had. Late last year a fellow Chinese Whisperings writer Tina Hunter contacted me about Absolute Xpress’s Flash Fiction Challenge. She told me to keep an eye out for the 1st December when the prompt for the challenge would be announced, adding my writing would definitely suit the anthologies they were producing. 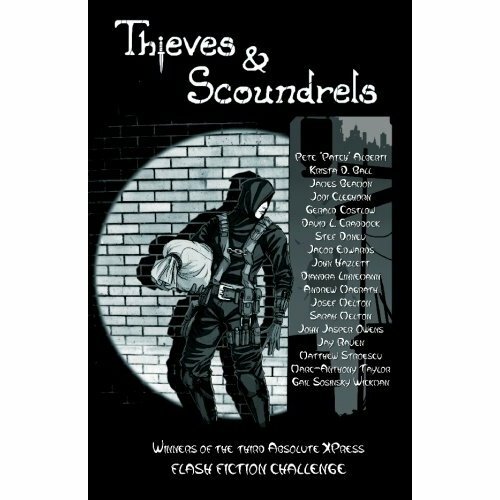 Thieves and Scoundrels is the third anthology, coming in the wake of Creatures of the Night and The Seven Deadly Sins (Tina had stories published in both!) cementing Absolute Xpress’s committment to the Flash Fiction form, which is growing in popularity with writers and readers alike. Would your characters try to swindle a dragon out of his treasure? Perhaps they’d try to steal the fastest spaceship in the galaxy? Or are they after something a little more sinister that’s in need of taking? Where ever and when ever they take place, the stories of these Thieves and Scoundrels will take hold of your imagination and ransom it back to you. I had a couple of ideas floating around in my head, especially after Vasia Markides and Anna Barros posted to their Facebook pages an article about a group of elderly Cypriots being charged with illegal gambling. 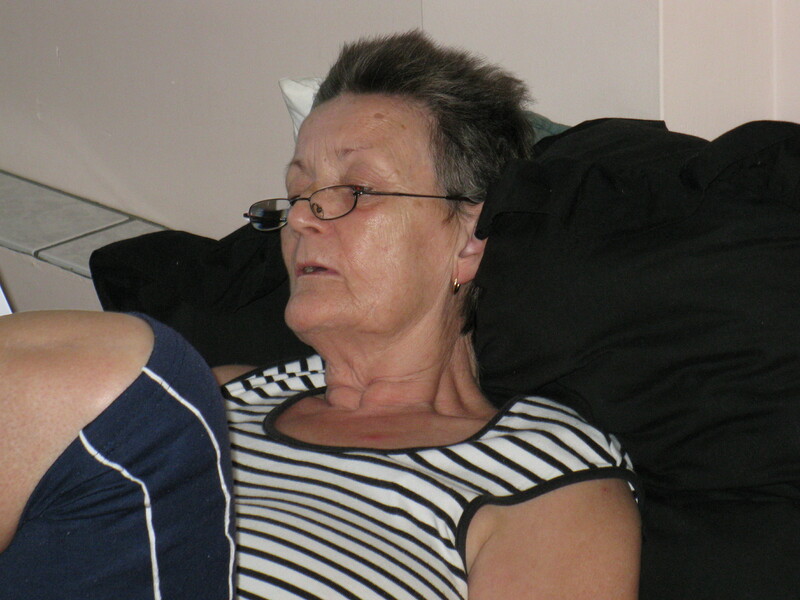 The youngest was in their mid-70s. While it didn’t end up firing for this competition but it is latent waiting for the right trigger. The anthology is scheduled for release later this month, so watch this space.